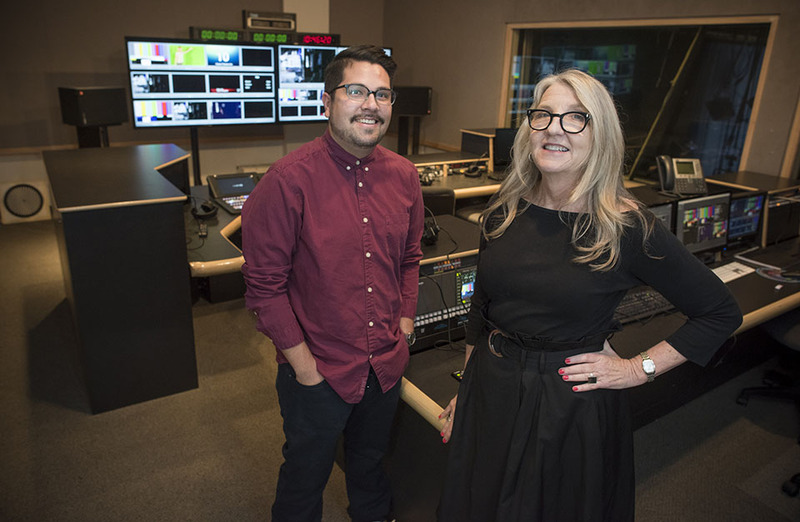 Professor of Cinema and Television Arts, Thelma Vickroy, and her student, Martin Ibarra, whose film was a semifinalist in the 2017 Student Academy Awards. Photo by Lee Choo. 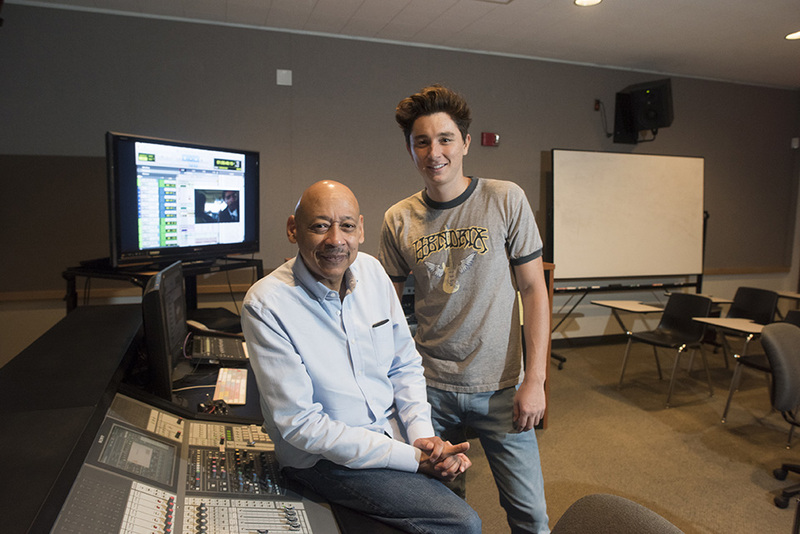 Professor of Cinema and Television Arts, Nate Thomas, poses with his student, Daniel Yonathan, whose film was a semifinalist in the 2017 Student Academy Awards. Photo by Lee Choo. Of the 1,586 films submitted to the 44th annual Student Academy Awards, only 85 — or 5 percent — advanced to the semifinals. Two of those films were made by students in California State University, Northridge’s Department of Cinema and Television Arts (CTVA). It’s the first time that two CSUN students have advanced to the competition’s semifinals. Recent graduate Martin Ibarra ’17 (Cinema and Television Arts – TV Production) produced and directed the documentary Serve, one of the semifinalists, which he originally created for his Directing the TV Documentary course. The film is “about the collaboration of volunteers working in the kitchen and food bank at Meeting Every Need with Dignity (MEND), a poverty agency in Pacoima, and the recipients of these services,” Ibarra said. “I wanted to focus on this topic for various reasons, but what was most important to me was to bring more recognition to MEND,” he added. Ibarra couldn’t have completed the project without his fellow Matadors, he said. His collaborators included David Lyons, associate producer; Jake Heitmann, writer; Josh Bantay, director of photography; Ricardo Garcia, production and post production sound; and Jenifer Becerra, editor. Ibarra’s project stood out because of the documentary’s unique style and the team’s dedication, said Vickroy, a CTVA professor and head of the Electronic Media Management CTVA option at CSUN. Vickroy also pointed out that the recognition is a big accomplishment for the CTVA Department. “CTVA documentary students completed this work from conception to the final project in 15 weeks,” Vickroy said. “Other schools’ students have more than one semester to work on their documentaries. “They competed and were semifinalists with the best film schools in the country,” she added. Serve was also selected for screening at the Highland Park Independent Film Festival on Oct. 7 in Los Angeles, where the film was awarded the Audience Choice Award for Best Short Film, in the Cinematic Spotlight Shorts Program group of the festival. The second semifinalist, Ben-Dod Sheli (Hebrew for “my cousin”), was written and directed by CSUN senior Daniel Yonathan. Yonathan said the film is about pain and hatred, and was inspired by a trip he took to a war-plagued Israel in 2014. The 20-minute fictional film is centered on the lives of two cousins with pained hearts, planning to kidnap and kill citizens who they think are threats to society. The duo flags down a cab, only to find themselves ambushed by another pair of men, also with pained hearts, that kidnap the cousins and want to hurt them because of their beliefs and values. The film’s goal was to shine a light on human beings’ unwillingness to consider another person’s point of view, Yonathan said. The student-director said he also wanted to highlight his colorful characters and show that high-stress situations aren’t mechanical. In a larger sense, Yonathan said, hidden in the movie’s subtext, the film demonstrates that the things that divide us — our pain, our beliefs, our idea of being right — is, ironically, what makes us so similar. Emmy-winning CTVA professor Nate Thomas served as Yonathan’s faculty mentor and said that he was impressed with the student-director’s storytelling abilities, a quality that’s integral to filmmaking. “Being a part of the media isn’t just for entertainment purposes,” Thomas said. “Film and media are so pervasive in this society that you have a responsibility as a filmmaker to tell a story. Daniel is a perfect example of that. The participating students expressed their gratitude to CSUN’s CTVA Department and said their classes prepared them for high-level work. “Taking courses like Editing with [professor] Deb Diehl, Documentary Traditions with [professor] Maria de las Carreras, Advanced Film Sound with [professor] Fred Ginsburg and Thesis Documentary with [professor] Thelma Vickroy truly shaped me into the filmmaker I am now,” Ibarra said.